The latest issue of Twist Collective is out and it is fabulous! I love a good inspiring magazine and Twist never fails to deliver. This issue has a few items I’m excited about, they all make me want to take a romantic stroll in the rain. 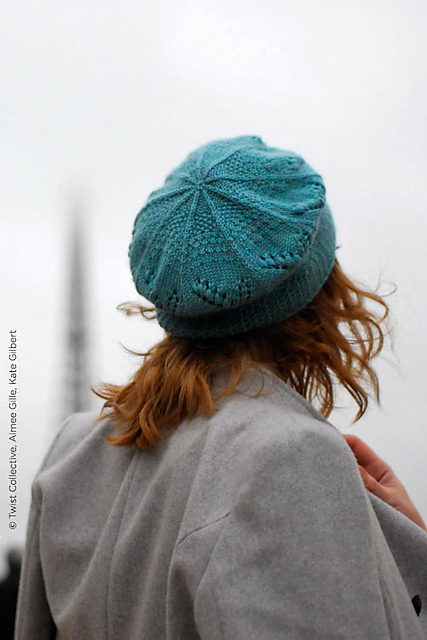 First up is Pont Neuf, designed by Emily Wessel, my better half at Tin Can Knits. This cardigan is knit seamlessly from the top down with the lace panel picked up and knit last. Pont Neuf is feminine while still utilitarian, and it has a bit of romance to it. The rosebud lace pattern makes me want to wear this sweater while taking a walk on the Sea Wall or through the woods. Probably holding hands, you get the picture! Galliera is a pretty slouchy beret. I love this design, it has a soft and cozy look with a vintage feel. A bit of lace and a bit of texture makes for a beautiful hat that will look good through the ages. Wavelettes is a great big swath of textured lace pattern to wrap yourself up in. As the weather turns cool in the spring evenings this item is a great wardrobe addition. It can be worn as a large scarf or a shoulder wrap depending on your mood. Something like this also makes for good vacation knitting if you have a road trip or plane ride in your future! You can peruse all of the patterns in the latest issue as well as articles on swatching and fixing your mistakes here. This entry was posted on Saturday, April 13th, 2013 at 10:23 pm	and is filed under Uncategorized. You can follow any responses to this entry through the RSS 2.0 feed. Both comments and pings are currently closed.